''''What do I need to start polishing guns?'''' These kits make getting going easy. With them, you can start polishing and the money from those jobs will help pay for a super, top-of-the-line setup. The Kits include both stitched and loose muslin wheels plus two Polish-O-Ray grits and our Bluing Instruction book that shows you how, and when, to use those wheels and grits to achieve the look wanted. WHICH KIT, 6'''' or 8''''? If you have a 1/3 or 1/2'''' hp, 1800 rpm motor, buy the 6'''' Kit. If your 1800 rpm motor has 3/4'''' to 1 hp, pick the 8''''. (A small motor can't pull large wheels.) 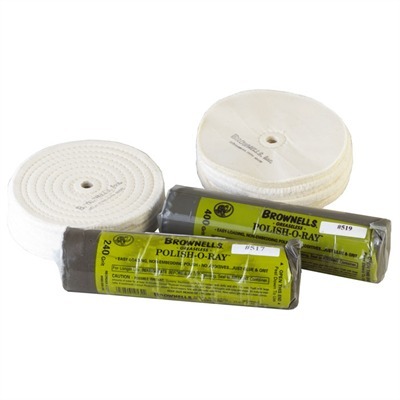 Mfg: Brownells SPECS: Kits contain: 6 Loose Muslin wheels, 6 Stitched Muslin wheels; 1 tube 240 Grit, 1 tube 400 Grit Polish-O-Ray and Instruction Booklet. Wheels are 3/8'''' (9.5mm) thick w/ 1/2'''' (12.7mm) arbor.